Charlotte Gibb "I spent my childhood romping around and exploring the wilderness areas in the mountains near my northern California home. The youngest of nine children, our father was an avid mountain climber and nature lover, and he made sure his kids were instilled with his passion for the outdoors. After he died in a climbing accident when I was very young, our mother continued to promote spending time in nature, ensuring that our vacations were spent outdoors camping, hiking and exploring. When I was 16 years old, my older brother gave me my first SLR camera, a Pentax ME Super. I thought I wanted to be a journalist then, and my camera quickly became an extension of my arm. I studied journalism in college for two years and worked for my city's newspaper, at which point I discovered that journalism wasn't for me. I transferred to the Academy of Art University in San Francisco and studied graphic design instead. I bought a used Beseler enlarger and turned my spare bedroom into a darkroom, where I spent countless hours in the dark happily experimenting with printmaking. 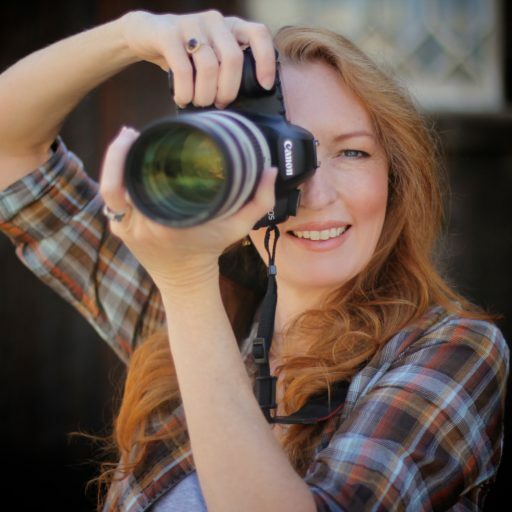 In the years following art school, I built a successful design business, got married, raised two wonderful sons, and currently use my camera to tell stories of the natural world. Frequently symbolic, my images strive to communicate the sublime beauty of the natural world with an eye oriented towards the subtle and sometimes overlooked elements of nature. I return to familiar places again and again to observe the changes brought about by the seasons, light and weather. My camera records what the eye cannot see: blurring waterfalls, vibrant sunbursts, birds' wings frozen in a moment of time. I use everything I know about the technology of modern photography to create images that will open your eyes to seeing the natural world differently." Truman Holtzclaw was a biology teacher by profession (Retired 6/22/01), a photographer by passion. He blends these activities in his roles as past presidents of the Sacramento Audubon Society and the Sierra Camera Club. He also has worked as a park naturalist for the State of California. After 15 years of serious photography, Truman has acquired and perfected the skills to artfully blend his biology background and his love of nature to create a collection of about 80,000 beautiful images. As his photography reflects, Truman understands how life systems work and interact. He studies wildlife in the great outdoors, and social life in our society at large. His favorite subject matter is nature, but he enjoys most all forms of photography. His photographic activities include attending and presenting workshops, leading field trips, competing in local and international competitions, preparing and presenting multimedia programs, evaluating photographic competitions, leading photo treks, photographing weddings, banquets, professional workshops and sporting events. Travels have taken him to the Amazon, the Andes, the Galapagos Islands, Germany, Switzerland, Austria, Italy, France and England; as well as Canada and the United States including Alaska and Hawaii. Six weeks as an exchange teacher in southern Japan also added to his photographic files. Although his foreign travels were wonderful, his favorite area for photography is still the western United States. Nature subjects, especially landscapes, occupy most of his time. His favorite images are those that show great texture & detail in the foreground and have strong impact in the background. Most all of his landscape pictures were taken within the first hour & half or last hour & half of the day. Light is so very important when exposing film. In addition to the singing "golden light" of sunset and sunrise, atmospheric conditions (rain, snow, fog, storms) can sometimes give that very special lighting moment that may never again be captured. Truman often uses reflected light (snow, canyon walls, water, sand, & others) to give unique lighting effects. Light and subject matter are probably the two most important factors he considers when making an image. I was born in the small town of Richland, Washington, a dry, desert region of the state. My father, an engineer, was working there during WWll. After the war was over our family moved back to my fathers home town of Kansas City, Mo. His grandfather father was a very avid photographer there and was president of the Kansas City Camera Club. He had a large darkroom and Michael often watched him develop prints, his Pyro stained fingers swooshing his prints back and forth in the developing trays. My grandfathers photography was of the Salon School type and often exhibited. My father was also an avid photographer, as well as my uncle..But they never seemed interested in art. They were engineers and chemists. My grandmother took him on the trolley downtown to the Kansas City Art Museums, when I was 7 and 8. These visits helped developed an early appreciation for art..The KC museums were beautiful, and full of paintings, and life size dinosaurs! By the time I was 13 I was winning a few art awards. He began studying Picasso and Cezzane at 16 and 17. When he was 17 his father he gave him a Ciroflex 21/4 camera. Thats when photography got to him. hooked looking at the world through a groundglass. It was a new time for photography. A time when photography entered the fine art arena. Ansel Adams, Edward and Brett Weston, and other west coast photographers were becoming popular. Street photographers were making a mark. I wanted to do that as well. I attended San Francisco State University as a fine arts major with an emphasis in photography and modern art..After some ventures working as a studio photographer and wedding photographer I concentrated solely on my personal photography projects, earning my living in Silicon Valley and then as a tennis instructor. Of course, the "burbs" were a vast wasteland for art types. I could not be inspired by the commercial world of photographing PC boards and nuts and bolts.. I only wanted to do photography for myself. It was my art form. And that was that.. Working mostly in isolation, developing an approach, was at times very difficult. But I stubbornly plugged away at the craft and art of it when I could.. In my 50's I became much more independent, supporting myself with tennis instruction, so that I could run off and photograph at will. ..Today I spend the majority of my time with photography. I am very involved in photographing California and in particular teaching photography creating books, printing and selling fine art prints, and exhibiting.